When I first learned that Mt. 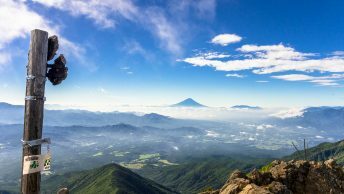 Tsukuba was included in the list of the 100 Famous Japanese Mountains I was baffled as it seemed nothing out of the ordinary. What was Kyuya Fukada thinking? If this foothill (it’s the shortest in the list) could make it why couldn’t ol’ Takao san get a guernsey in the top 300 – it just seemed wrong. Anyway it is what it is, enough ranting and on with the hike. A nice thing about Mt. Tsukuba is its proximity to Tokyo which makes for a comfortable day out. From Akihabara Station take a Tsukuba Express train to Tsukuba Station (45 mins, 1,190 yen). While the train looks rather meek from the outside it hooks along at 130 km/h which is about half the time the Joban Line used to take. The hike is immensely popular so waste little time making a beeline for exit A4 and bus stop no.1. Even on weekday there was a healthy crew lined up for the first bus departure at 8:00 am to the Mt. Tsukuba Shrine (35 mins, 720 yen). Most folk seem to start from the shrine and finish at the Tsutsujigaoka つつじヶ丘 but either way is fine. From the bus stop nosy across the street past the humongous torii gate and head up to the Tsukubasan Shrine 筑波神社. The Miyukigahara course starts adjacent the lower cable car station. Climbing time to the Miyukigahara is around 75 minutes at a steady pace. The trail is rocky and steep in sections and passes through some tracts of giant Japanese cedar. Arriving at the viewpoint area is met with a parade of late Showa era omiyage shops, restaurants and a rotunda which doubles as an observatory. Fine weather offers excellent views across the Kanto Plain as well as Lake Kasumigaura, the second-largest lake in Japan. Mt. 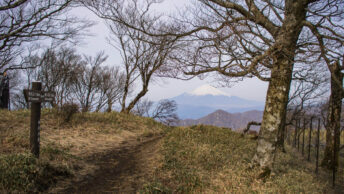 Tsukuba is made up of twin summits with Mt. Nantai 男体山 (871 m) a 10 minutes detour up to your left. The views from the top are a tad hemmed in but you get a good look over the Nikko mountains. The crumbling Art Deco building is the original mountain weather station around 90 years old. When you return the saddle continue along the trail to Mt. Nyotai 女体山 (877 m) which marks the highest point of Mt. Tsukuba 筑波山. The rocks which jut out were jam-packed making it a battle jostling for space. Picking out Mt. Fuji and the Tokyo Skytree is possible in clear conditions. The final stretch down to the Tsutsujigaoka ropeway station takes a little over an hour. The first part has a sharp downward gradient with a penchant for bottlenecks with hikers scrambling up. Look out for some interesting rock formations such as gama-ishi (Frog shaped rock) and benkei-banamodori which sits rather precariously. 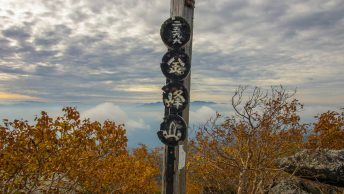 After 30 minutes you’ll come to a trail junction with the option of circling back to the Tsukubasan Shrine via the Shirakumobashi course (45 mins) or taking the Otatsuishi course to Tsutsujigaoka Station (35 mins). Nearby the ropeway station there is a small park to take lunch. Like most of Mt. Tsukuba this area is also overly-developed, music blares from a PA system and generally looks worse for wear.